A submission of this has been delivered to the New Mexico Ski Hall of Fame in support of the induction of Toni & Ilse Woerndle into their honored group. 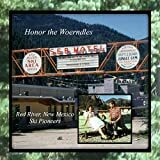 This tells a little of their lives, staring in the mountains of Bavaria and continuing to Red River, New Mexico. Toni was original ski school director at the ski area's startup season in 1959. Together they made the Alpine Lodge the center of the local ski world. I have this here so you can purchase a copy at the lowest price Amazon allows. With his copy you can have a short read and then loan it to a friend via a simple email, they can load to their Kindle or read on any device with a free app. They can then read it for up to 14 days at the max, and then it's returned to your device to share again to another friend. I thought, although the booklet can be read and downloaded at the FaceBook page, "Honor The Woerndles In 2019", this might reach more people that aren't into the social media world. Share it with a friend in the NM ski world that might like to send in their own submissions, please. A kaleidoscope of voices, Ski Pioneers focuses on the most dynamic and colorful characters in the history of American skiing. Tracing the lives of Taos Ski Valley founder Ernie Blake and his early skiing friends, this book goes beyond biography to tell the origins of the downhill sport in the West. Assembling interviews with some of the greatest names in skiing, Rick Richards describes the making or Ernie Blake, the man who envisioned a world-class resort in Taos Ski Valley. He follows Ernie from Europe to New Mexico, recounting events that shaped Blake's life and changed American skiing. From the first runs at Sun Valley to the steeps of Taos today, Richards recreates the pioneering journeys of the first, innovative skiers in the nation. With twenty-two chapters of reminiscences, humorous anecdotes, and commentary, and more than 250 historic and personal photos, Ski Pioneers is the most detailed look at ski history to be published in recent decades. For two decades around the turn of the second millennium, Tom and Elisabeth Brownell, the owners of the reputable, in the meantime bulldozed Thunderbird Lodge, offered their unique "Jazz Legends", an annual music event of a few days for several winter seasons. It brought great musicians of the world of jazz together and it created unforgettable hours of jazz history. The following recollection will offer essential memories which ought to be brought to paper for the world to realize the artistic greatness and musical weight of these happenings.